The latest Amdocs Recruitment 2018 recruitment notification is out for a while for the candidates who are sincerely trying hard to get the job in the IT Sector. Company officials had disclosed this advertisement to hire the skilled and capable aspirants for various vacant positions in the organization. Doing job after completing the education will help the fresher aspirant to improve knowledge on various programming languages and to uplift their career. In this page, we are providing the complete information about the Amdocs Recruitment Process for freshers candidates. The applicants who are willing to make their career in the dream company like Amdocs can refer this page and come to an idea about the latest Amdocs Careers 2018 job openings situated across India. Aspirants who are searching for the jobs can have a look at this Amdocs Careers For Freshers article. In Amdocs, there are more than thousands of employees and now the authorities are seeking for more aspirants who are talented enough to fill the vacant positions as listed below. Amdocs is inviting the applications from the candidates who had possessed the announced educational qualification. Desirable aspirants may apply in online by visiting the official website. In the consecutive section of this page, we are providing the complete details related to the recruitment like Amdocs Eligibility Criteria for freshers, marks criteria, selection process, salary details and some other valuable information in an understandable manner. Once check and apply for the Amdocs Job Openings. Candidates can also check the Amdocs Syllabus And Test Pattern and Amdocs Placement Papers from our website to crack the Amdocs Written Test with the good score. At this point, we listed the latest job openings in the Amdocs company. So freshers who are seeking for the job can check from this page. The authorities of the Amdocs will organize the selection process in various levels. Each and every applicant have to face the rounds to get the job. to be ready to face any type of rounds as the part of the selection process. To clear the interview rounds the aspirants should have a basic idea about the questions so have a look at the Amdocs Interview Questions furnished on our web portal. Should have the ability to design, develop, modify, debug the software code. Able to resolve and investigate customer complaints regarding service. Must have consists academic background from 10th standard onwards. There should be no backlogs at the time of applying. Well-organized with good communication and reporting skills. For the freshers who got selected in the selection process can expect the salary of 3 to 3.5 lakhs per annum. And for the experienced aspirant’s salary will be based on their years of experience and the knowledge. For the easiness of the aspirants, we have furnished some simple steps to about how to fill the application form. Follow that steps and complete the registration process without any delay. Candidates who are applying for the Amdocs Off Campus 2018 can also follow these steps. Visit the official website of Amdocs that is www.amdocs.com. Look for the “Jobs” section and click on it. A page will appear on the screen with the search columns. Here enter the location and category. Then the location wise latest jobs will display on the screen. Select the interesting position and click on it. Refer the responsibilities and requirements of the particular position and proceed to apply. Finally, take a print out of it for the later use. 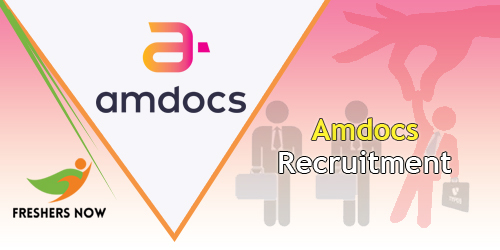 Candidates are satisfied with the information about the Amdocs Recruitment 2018 given on this page. Keep visiting our portal freshersnow.com for the latest updates.